« Spokes Bulletin 121: Cash cut averted? 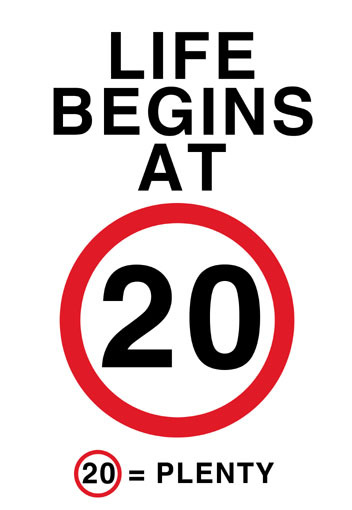 The Council’s 20mph policy is enshrined in its Local Transport Strategy which promises that residential, shopping and other streets with significant pedestrian and/or cyclist use will become 20mph. A wide-area trial in South Edinburgh was widely supported by residents in before and after surveys – with support growing further once people had experienced the trial. 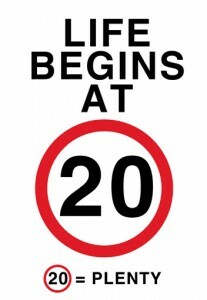 The Council’s then undertook a massive city-wide public consultation on the streets to be included. They received 2500 responses to a questionnaire, 250 emails and many further comments at public meetings across the city. In the survey the plan was supported by 71% of women, 55% of men, 72% of parents, 52% of regular car users and 74% of regular cyclists. The only group identified from the results as opposing the plan was motorcyclists. Despite this, the Council received some very negative press publicity, such as this Jan 12 Evening News article and editorial. The press also gave extensive publicity to plans for an anti-20mph march and taxi-ride, expecting hundreds of marchers and the Old Town brought to a standstill. In the event, 12 taxis turned up and some 30-50 marchers!! Nonetheless, many myths about the Council plans are flying around, so we welcome the Council’s initiative to publicise the reality of what is happening, and the reasons for it. The first stage of the campaign includes a flyer and a FAQ [click the pictures]. Social media has also seen a great deal of thoughtful effort supporting the Council, some of the best articles coming from the DeadDogBlog. 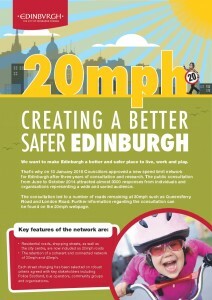 For more information, or if you have any questions about the scheme, see the Council’s 20mph web pages and/or email 20mph AT edinburgh.gov.uk. On March 17, the Transport Committee will make a final decision to go ahead, including the phasing of the implementation plan. 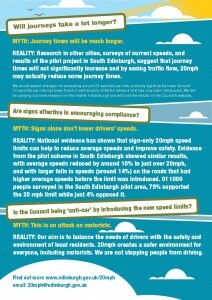 There is sure still to be some opposition, so if you like what the Council is doing, tell your Councillors now!